Reducing Energy Subsidies without Hurting the Poor? For at least five years the IMF has been badgering its members about implicit and explicit subsidies on energy. Its most recent salvo points to enormous potential gains from subsidy reform. The ideal energy prices would reflect not only the cost of production and global supply and demand, but would incorporate local and global health and environmental costs of air pollution and carbon emissions– and the fiscal losses and inequality effect of subsidies (the rich benefit more because they use more energy). According to the IMF, eliminating post-tax subsidies in 2015 could raise government revenue by $2.9 trillion (3.6 percent of global GDP), cut global CO2 emissions by 20 percent, and reduce premature air pollution deaths by an impressive 55 percent. It looks like a no-brainer: another trillion-dollar bill on the sidewalk. Reducing subsidies is even tougher in developing countries because though they benefit the rich more, they hit the poor and the emerging or struggling middle class hardest. For many developing countries, the tax increases stipulated by the IMF (‘Corrective Fuel Tax Estimates’, Annex Table 6.2.1.) would represent multiple times their average citizen’s daily consumption. A recent World Bank report shows that households in the poorest nations spend as much as 10 percent of their incomes on modern energy (kerosene, LPG, gasoline and diesel, electricity and natural gas): 9.8% of the total in Thailand, 9% in Vietnam, and 7.2% in Indonesia. Most of this goes to cover basic necessities, such as cooking or boiling water for drinking, with little room for cutting back. At the same time, energy subsidies crowd out public spending on vital services such as health, education or infrastructure (consider the case of Pakistan, where government spending on fossil fuel subsidies was over three times higher than spending on public health) with a double whammy on the poor who benefit most from these public goods. 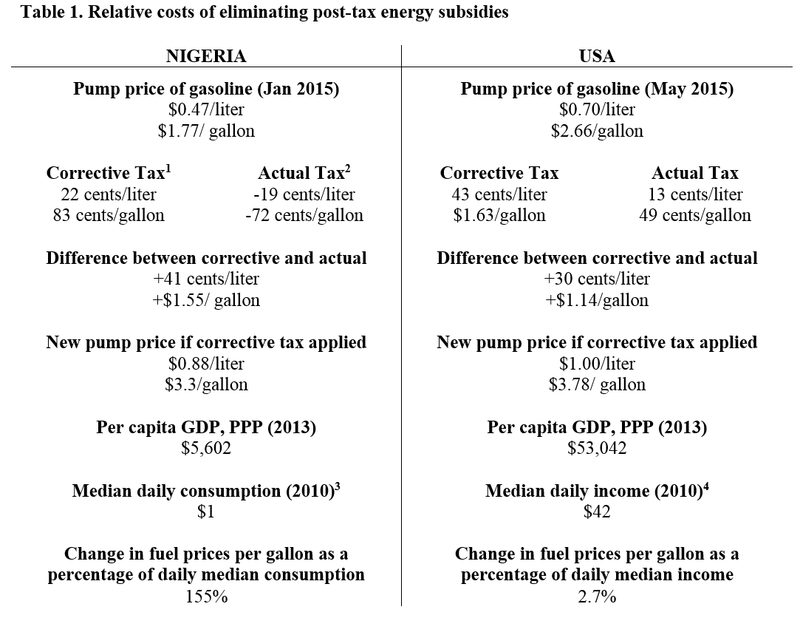 Compare, for example, what the post-tax energy subsidies would mean for citizens of Nigeria compared to the United States, using these estimates of median consumption and income (Table 1). The “right” price in Nigeria would require an increase of $1.55/gallon for gasoline – compared to estimated median daily consumption of about $1/day (in 2010). Median income is higher in Brazil at $8.50, but low enough to put people in the streets when bus fares rose in 2013. In contrast, the recommended ‘corrective’ fuel price increase in the US would be below 3% of the daily income for most Americans. When Nigeria tried to cut the subsidy and raise fuel prices to $3.50/gallon in 2012 the cost of food and transportation doubled, and mass demonstrations and a national strike followed. The government eventually reinstated a (lower) subsidy. Taking a more strategic and successful approach to energy subsidy reform, India and Indonesia have recently taken advantage of low crude oil prices to cut subsidies and increase taxes on their petrol products. Indonesia’s reform will save the government $20 billion in 2015, while India’s tax increases are expected to free up about $1.6 billion in funds. Nancy remembers Christine Lagarde relating (in this speech at CGD) how Iran reduced its fuel subsidy: by depositing a compensatory amount in every citizen’s bank account – the same amount mattering relatively more for the poor than the rich. The Iran story illustrates the need to couple energy subsidy reform with cash transfers to the relatively poor; that’s getting easier to do. India is making use of its biometrics-based unique identification program to switch from blanket price-based subsidies in LPG gas to direct compensation payments. A review of the program estimated that its nationwide implementation will save the government over $1 billion a year. As targeting of the subsidy moves from voluntary opt-outs to a more needs-based approach, the savings and long-term benefits for the poor will be even greater. The bottom line: The next IMF study needs to link getting energy prices right in developing countries to getting on with cash transfer and ID programs. Trillion dollar gains to local economies and to global welfare are a no-brainer.